The FLOW Strawberry Festival and Book Sale will be held at the high school tomorrow, 10 am to 4 pm. 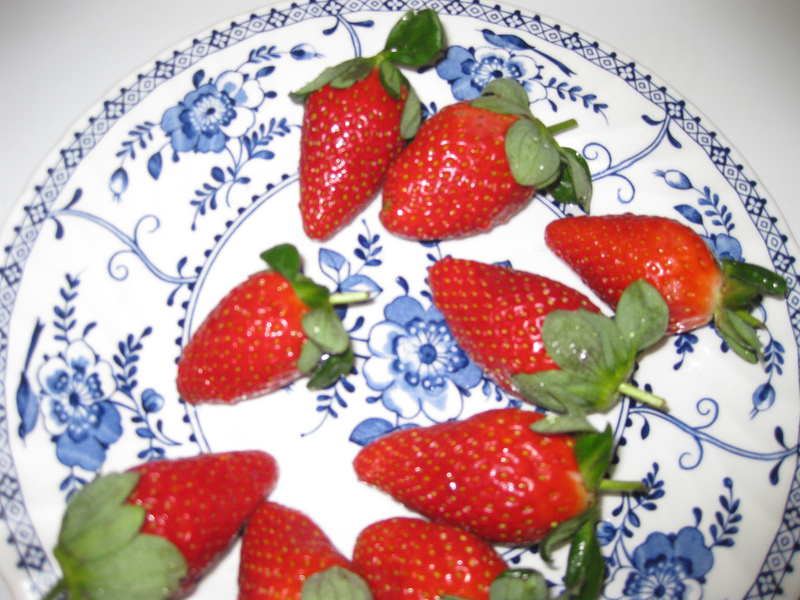 Don't miss out on the strawberry shortcake! The Poetry Friday Round-Up is taking place at Reflections on the Teche. Stop by, and tell Margaret I said "Hi!" Today you might find that you can't renew items on your account, place holds, book a museum pass, or even check to see if we own a title. We are doing a system upgrade and we expect to be without most of the normal library functions we perform on a daily basis. If you do visit the Library today, our internet computers are still available and we can check out books the old-fashioned way--by writing down the item barcodes by hand! 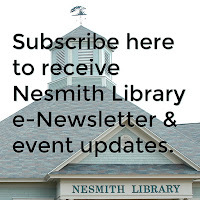 However, in order to do so requires that you come with your Nesmith Library card as we have no way to look up your account. We strongly urge all Library users to come with card in hand any time you visit! Make it a habit--don't leave home without it. This is also the first day for the general public to attend the Friends of the Library of Windham (FLOW) Book Sale. The sale will run here at the Library today, from 9 AM to 6 PM, tomorrow from 9 AM to noon, and any items not sold will be moved to the Windham High School for the Strawberry Festival on Saturday! Tomorrow Is National Hamburger Day! Yes, tomorrow is the day to serve a big, juicy burger for dinner! Hit the supermarket today and purchase a few pounds of ground beef, turkey, or combination. USA Today recently published an article on BIG burgers, click here for the details and photos. Don't bother looking for a ginormous burger in New England, which, I suppose, is a good thing! We can provide you with information of cooking or grilling burgers of all types, including vegetarian ones. 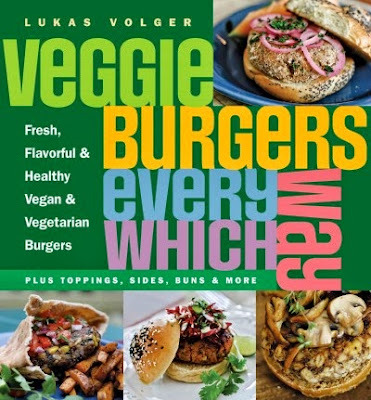 If you're strictly non-meat, look for Veggie Burgers Every Which Way Fresh, Flavorful and Healthy Vegan and Vegetarian Burgers—Plus Toppings, Sides, Buns and More by Lukas Volger, which we have in ebook format as well as in a physical book format [641.5636 VOL]. Illustrator, Debbie Ohi, is a strong proponent of doodling. She is trying to encourage children to doodle, too. This summer she is hosting a doodle sharing opportunity for kids. This summer, have some fun with turning found objects into doodles! If you're a young artist 12 years old or younger, I'd love to see your work! I'll display some of the art in a gallery later this summer and will also send out prizes. Deadline: August 14, 2015. To read more about the challenge, visit Debbie Ohi's website. 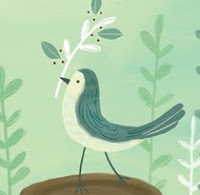 She recently (May 12) published a picture book, Where Are My Books? It is on order, so look for it to arrive soon. Zentangle is a "hot" artsy-crafty-type activity which could be considered a form of doodling. It uses repetitive patterns and is reported to increase focus, creativity, and relaxation. We have several zentangle books in our collection in the 741 section. When I was a child, Memorial Day was known as Decoration Day, the day people went to the cemetery to decorate the graves of fallen soldiers. It was always on May 30, so one was never guaranteed a three-day weekend. 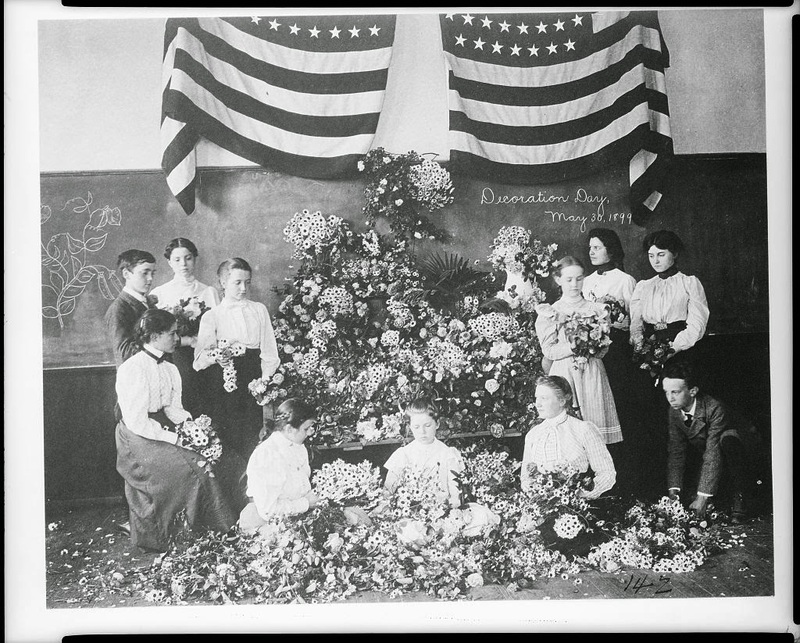 This photo, from 1899, shows school children preparing daisies to be used to decorate grave markers. The Library is closed today. We will re-open tomorrow morning at 9:00 am. Poetry Friday--"A Letter from Home"
We've had quite a sad week here at the Library. We lost our friend, and our co-worker, Jena. It is difficult to put into words what the loss means to each of us. I've selected a poem today from New and Selected Poems by Mary Oliver [811 OLI], which I hope can speak in some way to everyone who grieves. The Poetry Friday Round-Up is being held by Matt at Radio, Rhythm & Rhyme. Matt is a New Hampshire poet and has recently sold a picture book. Congratulations, Matt! 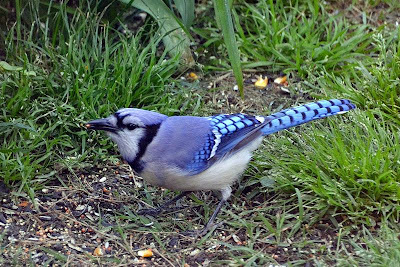 Photo by Tony Alter, courtesy Wikimedia Commons. It's National Backyard Games Week! May 18 - 25 is the week set aside for outdoor games. The spring is the right time for organizing outdoor activities with family and friends, and, since Memorial Day weekend coming up, backyard games can keep everyone happy while the hamburgers and hot dogs cook on the grill. There's a Pinterest board from last year's National Backyard Games Week that can get you going, or use "outdoor games" as a search term to come up with boards such as this one. 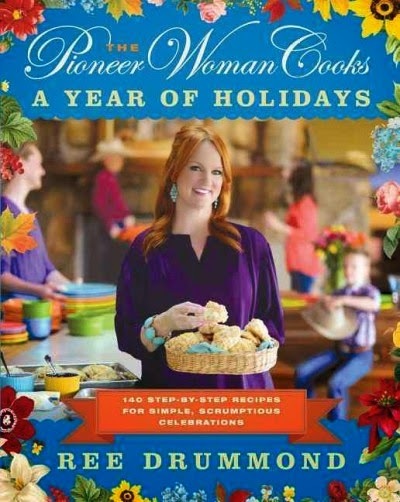 And while you're at it, we have plenty of grilling cookbooks, too! I'm attending a NH Archives Group conference today, so I thought it would be a good opportunity to tell you about an online archive that you may not be familiar with--Internet Archive. The Internet Archive makes for a one-stop shopping experience in that it contains materials from such diverse collections as The LibriVox Free Audiobook Collection, The Library of Congress, The Prelinger Archives (thousands of documentary and other films), and the Grateful Dead! The Open Library part of the Archives gives you full access to the text of thousands of out of print books, which is especially helpful to those doing history and social history projects. Also, some of these books are made available as ebooks. This is great for those readers who are revisiting the classics. Readers can find, for example, one of Jane Austen's lesser known novels, Mansfield Park, in 8 ebooks! A little bit at a time is probably the best way to watch Looney Tunes, however, if you really feel the urge to indulge, we have the Looney Tunes Golden Collection, in six volumes. Each volume has four disks! That's a lot of looney! Every once in a while I come across an art project from recycled materials that really makes me pause and say, "Wow!" 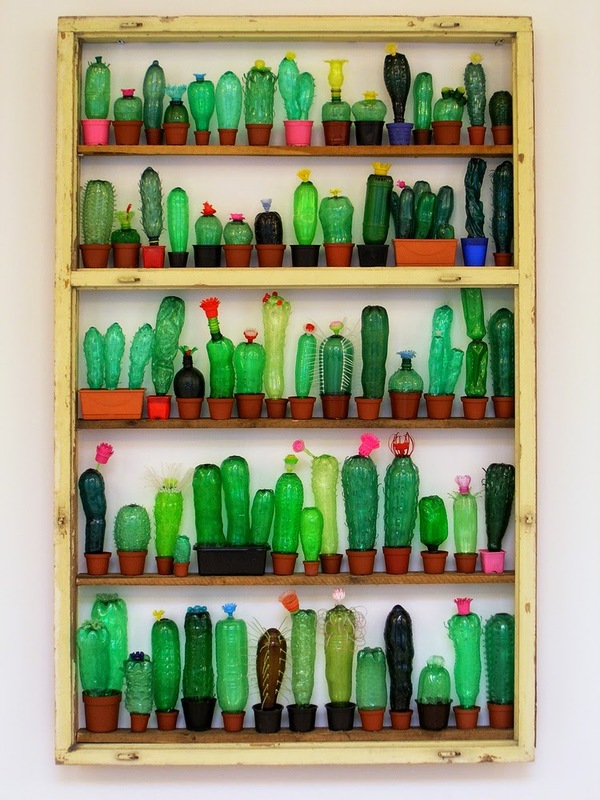 If you click on the article, "An Artist's Visionary Plastic Bottle Sculptures Offer A New Perspective On Garbage," you'll see a virtual cactus garden made by Veronika Richterová, an artist from the Czech Republic. Her medium is plastic soda bottles! Veronika Richterová, The Collection of Cactuses, Photo Michal Cihlář. Click on the artist's website. The photos of brown bottle bats and a green bottle crocodile, will astound you, too! Some people might ask if what we're looking at is really "art." That's a question that is addressed in one in a series of books for kids called, But Is It Art? : Junk Sculpture by Alix Wood [J 731.2 WOO]. "What is art?" has been discussed for decades, and will continue to be discussed--probably forever! If you want to get creative with recyclables, then I'd recommend spending time on Pinterest and using "art from recyclable materials" as your search term. There are dozens of boards and thousands of projects to explore! We also have plenty of books to get you started, too, especially in the children's room. One such title is Organic Crafts: 75 Earth-Friendly Art Activities by Kimberly Monaghan [J 745.5 MON]. Photo by Diane Mayr, taken in front of the Library a week ago while in full blossom. Visit me at my personal blog, Random Noodling, for the Poetry Friday Round-Up. Last week, on NPR's Only a Game, there was a repeat broadcast about girls in baseball, click here to listen. The subject of girls in baseball was made popular by the 1992 film, A League of Their Own. The film fictionalized the girls' baseball leagues that sprung up during World War II due to the lack of male players, many of whom went off to serve in the military. World War II was not the first time, though, that women played professionally in baseball. Back in 1931, Virne Beatrice "Jackie" Mitchell pitched in an exhibition game against the home run king, Babe Ruth. 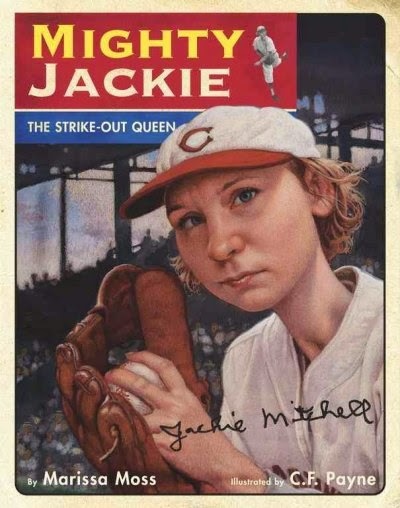 Jackie, all of 17 years-old, became the first professional female pitcher in baseball history. She struck out not only Babe Ruth, but also Lou Gehrig! You can read about her feat in Mighty Jackie: The Strike Out Queen by Marissa Moss [JP MOS]. In a case of sour grapes, Ruth is reported to have said, "I don't know what's going to happen if they begin to let women in baseball. Of course, they will never make good. Why? Because they are too delicate. It would kill them to play ball every day." We have a book for children specifically on Japanese woodblock prints and how they are made: Art of Japan: Wood-Block Color Prints by Carol Finley [J 769.952 FIN]. If you are particularly interested in how the prints are made, be sure to visit the MFA on Sunday, May 24, for the "Artist Toolbox Cart." The Library of Congress has more than 2,500 Japanese woodblock prints and drawings in its collection, "Fine Prints: Japanese, pre-1915." This print by Hokusai is on the collection's home page! Teahouse at Koishikawa. Hokusai Katsushika, betw. 1890 and 1940, courtesy Library of Congress. Mystery writer, Ruth Rendell passed away on May 2 as a result of a stroke she suffered earlier in the year. Some famous people fade from memory once they pass away. In many cases it is because their lives were an open book with nothing new to learn. Other people continue to spark interest years later and this is probably because the public never knew the "real story," behind the personality. Several names spring to mind: James Dean, Marilyn Monroe, and Elvis Presley. Kurt Cobain: Montage of Heck, looks beyond that well-known story. It gives motion to Cobain's artwork and photographs, and spends time with his media-averse family. And it's a film that is, at times, hard to watch. Rolling Stone magazine projected massive interest in the soundtrack to the film because it includes an previously unreleased 12-minute acoustic track. We have an order in for the companion book to the film and we will order the soundtrack and DVD when they are released. I spent the last weekend in Salem, MA, for the Massachusetts Poetry Festival. If it's possible to be poetry-sated, then I am! 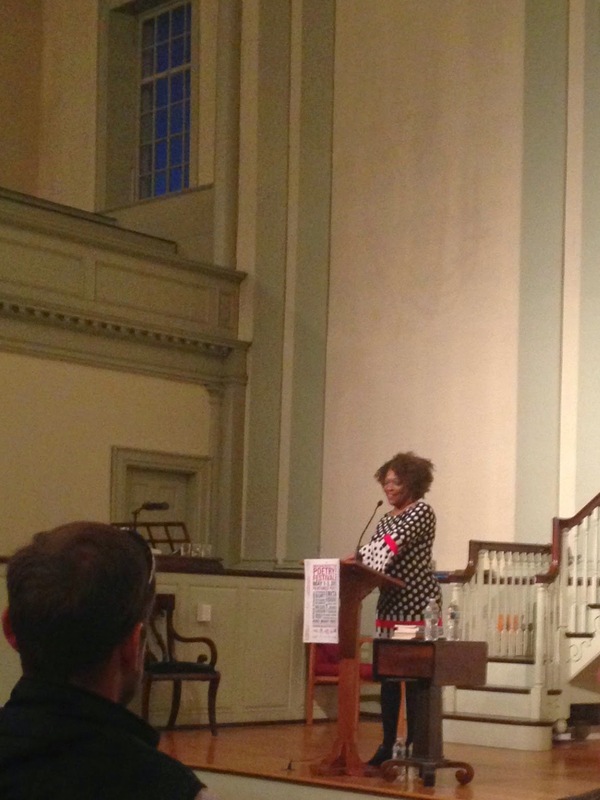 Saturday night the headline readers were Richard Blanco and Rita Dove. I can't imagine two more outstanding poets, who are also excellent readers, then we had in Blanco and Dove. Both were extremely congenial and open on stage. The audience left not only with poems running through their heads, but also with little bits of personal information about the poets. What a great way to spend a Saturday evening! Such a simple poem, yet sweetly moving! If you wish to read more Rita Dove, Selected Poems [811 DOV] would be a good place to start. Michelle Barnes is the Poetry Friday Round-Up Hostess at Today's Little Ditty. Be sure to stop by and tell her I said, "Hello." 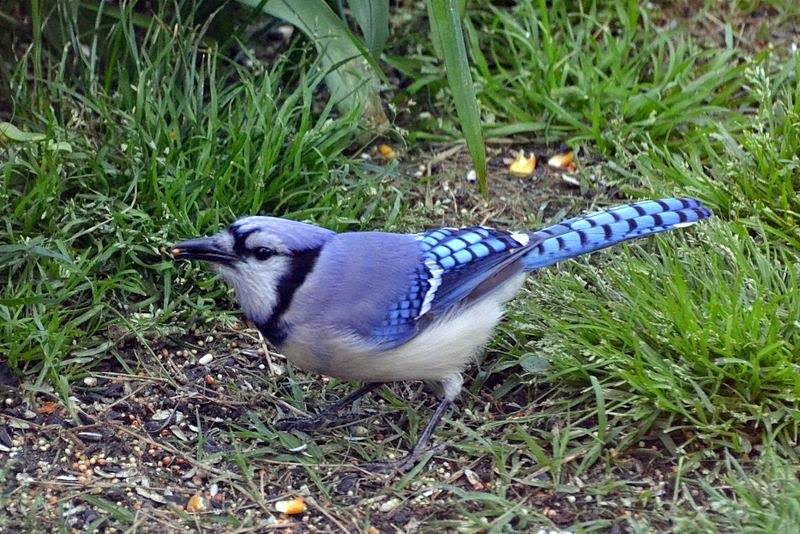 Photo by Diane Mayr, all rights reserved. One hundred years ago today, the British ocean liner, Lusitania, was sunk by a German U-boat (submarine) off the Irish coast. One thousand, one hundred ninety-eight passengers were lost including more than one hundred Americans. It was an event that started the United States toward entry into War War I.
Nonfiction writer, Erik Larson, recently published Dead Wake: The Last Crossing of the Lusitania to mark the anniversary. We have several copies of the physical book [940.4514 LAR], a 3M ebook, and an audiobook [AB/CD 940.4514 LAR]. We also have other writers' exploration of the sinking of the Lusitania in the 940.4 section. I'm giving you a heads-up so that you can give a little thought to a gift prior to Saturday night when you run off to CVS and purchase a gift card from their rack of iTunes, Chilis, Old Navy, or one of the umpty-umpt other chain stores and restaurants! Or, you could plan a home-cooked (by you) meal or a French tea. We have so many books to help you do this, that I'm finding it hard to narrow it down to five! 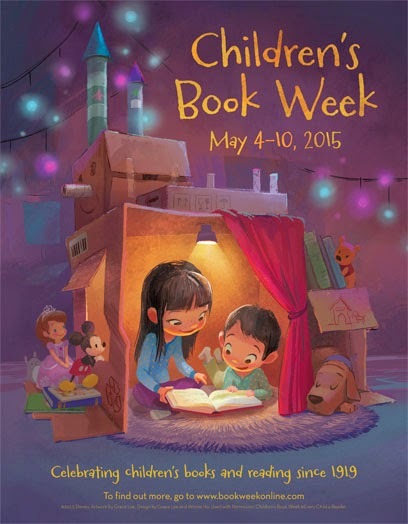 This week is Children's Book Week--an annual celebration of books for kids now in its 96th year! It is sponsored by the Children's Book Council and covers kid-lit for toddlers to teens. The video below was shared by a writer friend. As writers, we found it interesting to see how the lyricist, Oscar Hammerstein, went about creating "My Favorite Things." And this song, "My Favorite Things," as is depicted in the film, it is sung by Julie Andrews as Maria to children who are scared during a rain storm. But, in the Broadway show, it was performed in a different setting. Maria, who was played by Mary Martin, is singing it as a duet with the Mother Abbess in the abbey. It's a song about things that they like. It wasn't a song about running from fear, but it was just something that gave them a chance to sing about things they found gratifying in life. Context is so important to meaning! I'm sorry we don't have the Broadway soundtrack, but we do have the film [DVD SOU] and the movie soundtrack [CD SOUNDTRACK SOU]. If you're interested, several GMILCS libraries have the libretto, The Sound of Music: A New Musical Play, from 1960. 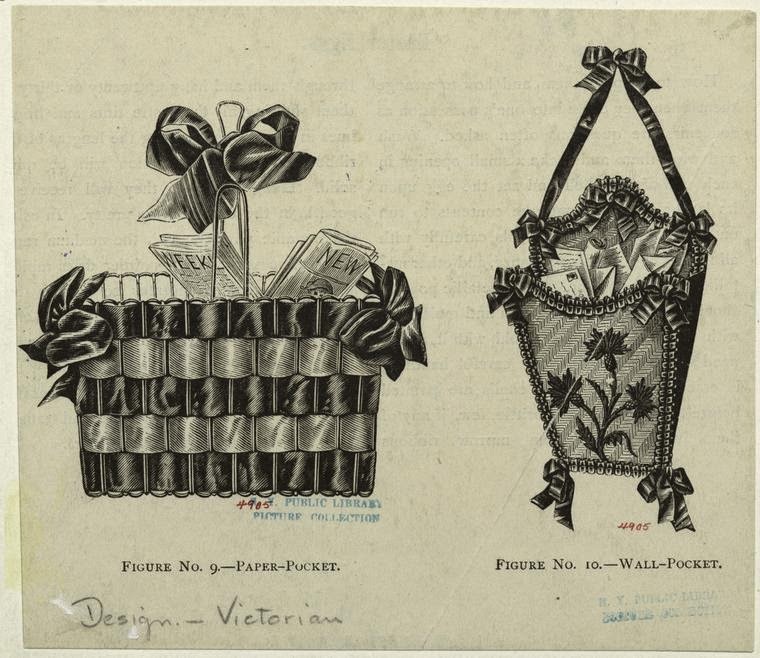 Pockets illustration (1889) courtesy NYPL Digital Collection. Yesterday was the last day of National Poetry Month, and, it was also Poem In Your Pocket Day! If you missed it, you can still tuck a poem in your pocket today and carry it with you all year long. its death not having reached its hasty bud. and eat the light and call itself alive. from The Swallow Anthology of New American Poets [811.608 SWA]. I'd be interested to know if you have a poem you carry with you. If so, please share the title, or the poem, in the comments. The Poetry Friday Round-Up is taking place at Space City Scribes deep in the heart of Texas!